Rex Brandt biography provided courtesy of �California Watercolors 1850-1970� By Gordon T. McClelland and Jay T. Last. Rex Brandt was a native Californian artist. He was raised in Southern California and in 1928, while still attending junior high school, began studying art at the Chouinard Art Institute. After a few years at Riverside Junior College, he continued his art education at the University of California (Berkeley), studying with John Haley. By the time Rex returned to Southern California, the core group of California watercolor artists was already forming. Although Brandt was still quite young, the more established artists immediately recognized his artistic talent and readily accepted him into the group. Within a few years he was winning awards from art shows throughout Western America. For a brief period, Brandt was involved with the P.WPA. Art Project and in 1939 was selected as one of the premier California watercolorists to exhibit in the New York World's Fair art exhibition, American Art Today. In the 1940s, 1950s and 1960s Rex refined his skills and developed the style of painting which would bring him international recognition. Teaching art was also an important aspect of Brandt's career. In the early 1940s, he promoted watercolor workshops in San Diego. After World War 11, he and Phil Dike formed the Brandt-Dike Summer School of Painting in Corona del Mar. This became one of the most successful watercolor schools in California during the 1950s era. From 1947 to 1952, he taught watercolor painting and composition classes at the Chouinard Art Institute. Through these classes and his eleven instructional books on watercolor painting, Brandt educated and inspired a large number of professional watercolor artists. Interview with Rex Brandt, 1983. 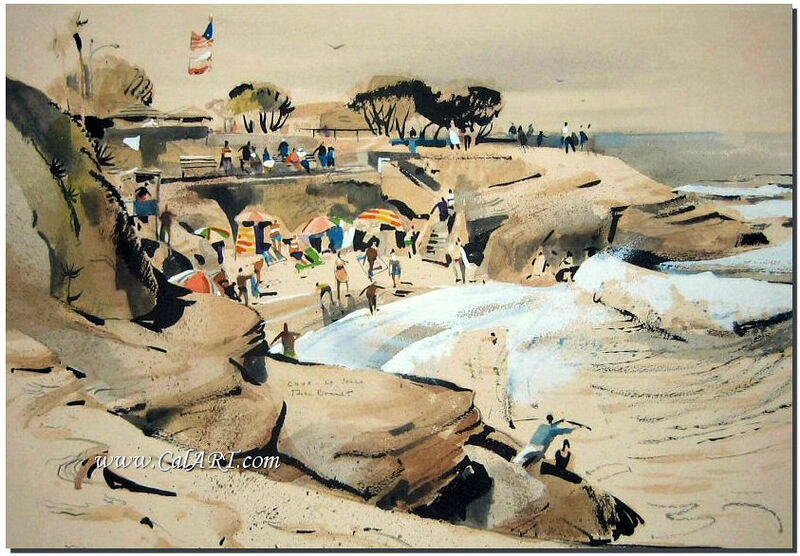 Original ~La Jolla Cove~ California Watercolor by Rex Brandt. This image is pictured on page 38 of the book "Watercolor Techniques and Methods" by Rex Brandt.